Rates are $199 per night for a single rate and double rate. Add 13% tax to those rates. Take advantage of our special discounted conference rate by booking your room with the NORDP-specific hotel reservation link below. The Omni Providence Hotel recently completed a $6.5 million renovation, transforming our guest rooms to fulfill the Omni Hotels & Resorts commitment of providing our guests with an authentic feel for the local flavor. 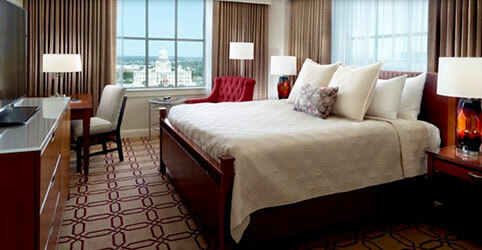 Our oversized guest rooms and suites are accentuated with breathtaking views of Providence and its downtown skyline, while providing luxurious accommodations and amenities guests have come to expect from Omni Hotels & Resorts. The in-room technology includes, Flat-panel HDTV, Dual-line telephones, Speaker phone, Voicemail, WiFi Internet service and AM/FM alarm clock. Work out in our premier fitness facility, the Capital Club Fitness Center, featuring a whirlpool hot tub. Swim year-round in our indoor heated pool or stretch in our yoga and fitness studio. If you prefer to work out in privacy, in-room fitness kits are available at the concierge, and deluxe fitness rooms are also available. Take advantage of our spa service. On-site restaurants, valet parking and self-parking at Rhode Island Convention Center. If you’d like to take advantage of spa services while you’re in Providence, there are several nearby, including Moderne Salon and Day Spa, Facing Thayer, A Beauty Spa and Salon Binaco. L T.F. Green Airport is located 10 miles from Omni Providence Hotel. Amtrak offers many daily runs between South Station and Providence. Amtrak ranges from $22.00 - $45.00 and takes 40 minutes. Schedules and fares can be accessed at www.amtrak.com. Taxi service to and from T.F Green into Providence cost approximately $35.00. Logan Airport is situated approximately 49 miles north of Providence. Boston is 40 miles away, about an hour drive. With its rich history, diverse neighborhoods, and legacy of arts, culture, and education, Boston has something for everyone. Check it out. Newport Beach is 50 miles away, a little over 1-hour drive. There’s a feeling you get when you step foot on these beaches. The warmth of the sand. The Atlantic drying on your skin. The perfect amount of sunshine and sea breeze. It’s where relief and invigoration meet, and it’s completely classic. Check it out. Rhode Island’s average temperature for the entire year is near 50 degrees, with April through June and September through mid-November the most delightfully moderate seasons.